There is only one event each year that combines three of my favorite things: wine, food, and home furnishings I can dream about having for my future home someday! 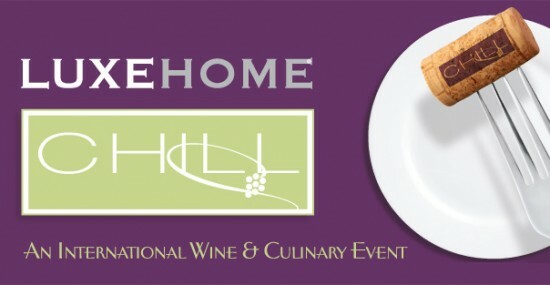 LuxeHome®, in partnership with Wine Spectator Magazine is hosting its tenth annual CHILL, an international wine and culinary event featuring some of the best wines from vineyards worldwide, being paired with small bites from some of Chicago’s most distinguished chefs. The best part is that you get to wine and dine your way around the Merchandise Mart’s collection of premier boutiques for home building and renovation all in the name of charity. Since its inception in 2007, CHILL has raised nearly 1 million dollars to support Chicago area charitable organizations: the Lynn Sage Foundation, Respiratory Health Organization and Saturday Place. I’ve attended the event in 2012, 2013 and 2014 and each year is better than the next. This year 150 winemakers and craft producers along with nearly 50 Chicago restaurants are participating including some of my favorites like Ada Street, Nellcote, Osteria Langhe, Siena Tavern, Farmhouse and more. LuxeHome® is actually the world’s largest collection of premier boutiques for home building and renovation with 30 different boutiques all in one location. I love to fantasize about my dream kitchen and bathroom as I eat my way through the event browsing through beautiful backsplashes, granite countertops and amazing ovens, ranges and more. This year I’ll be snapping my way through the event, so make sure you follow me at StephCal87 for a chance to see everything I eat and drink along with some amazing home furnishings. Tickets are still available and can be purchased easily online in advance of the event here. Hope to see you all there!